Look like this LowRes Jam have been fun for us glbasic developer and nice to see some activity again. Nice to see. 64x64 is a fun resolution. 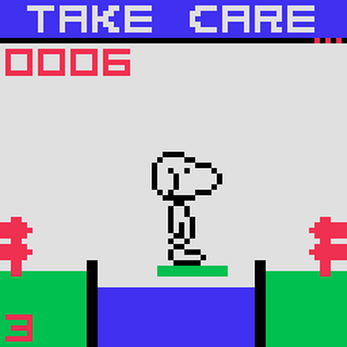 Its a game based on a Commodore 64 game named Snoopy, using colors from a Fairchild Channel F (but im cheated using a black color as well, which is impossible to do, but hence its not a direct Fairchild Channel F game anyway, but im liked the palette really). Im like that game as a kid, and thinks im could do some fun out of that one. 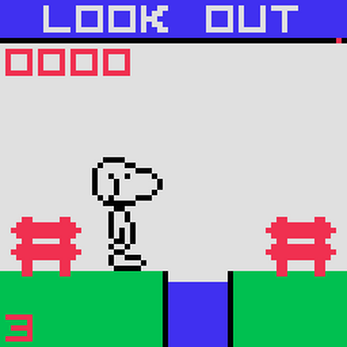 Im plans to add more levels, but the game do have 25 (from v1.1) levels, some from the original game, and some of my own take. You need to complete them twice to complete the game with a final score. im did 25 screens and did not do anymore screen. Im submitted the game, quite 5 days before deadline. Im later release a Android version (even its was only thinked as a desktop game this time, not as a mobile game). We did 3 glbasic finished for the jam, and first time ever im submitted a game to a jam ever. 4 projects have been finished. Look, im forget Bouldery, im have follow it too of course (Im cant see the thread here, but add it Matchy). Its nice we did some games with such of this kind of Jam. More of that. Hopefully we see more activity. im thinks 64x64 pixels was a pretty fun resolution to work with. We was near finished 5 games. But im will finish the 5'th game later with Ian and Erico later when they have time. Even its did not submitted due last minuttes bugs, we Well of course finish it.